The speeches of Demosthenes were so well crafted that his fellow orator Pytheas said they “smelled of the lamp,” meaning that the tight logic, the precise words, and the elegant phrasing could not have been dashed off in a day. Demosthenes had to have worked into the night … by the lamp. How did Pytheas know? Did he look through a window and actually see old Demo burning midnight oil? Doubtful; Demosthenes lived in a cave. No, the evidence of his diligence and skill was internal and obvious in the final product itself. Imagine … judging a written work by internal evidence. How quaint. 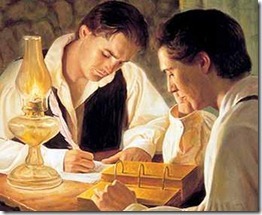 It is well established that the complexity and intricacy of the Book of Mormon already give it the smell of the lamp, but does it have another smell – specifically, are there any internal indicators that suggest the Book of Mormon was engraved on plates, as Joseph Smith claims, before it was written on paper? Does it have the smell of engraving? 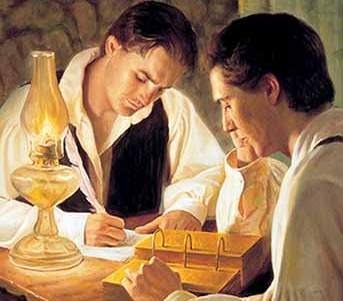 Both sides agree that Joseph dictated the Book of Mormon to scribes, but what was he looking at as he did? Would there be anything unusual in the text if the source material had been engraved on plates rather than written on paper? The key is how the original author(s) in each explanation would have handled mistakes, and what comes through in the finished product. If Joseph’s explanation is correct and one of the original authors made a mistake on metal centuries ago, he would not very likely throw away the plate and engrave the correction on a new one. Rather, he would scratch it out or engrave a follow-on clarification. Joseph would have dutifully translated the text exactly as written. But if the alternate explanation is correct and the author made a mistake on paper in the 1820s, he could throw away that sheet and write the correct phrase on a new one. Or he could erase it (Benjamin Franklin was selling pencils with erasers as early as 1729, an exact century before) or scratch it out knowing that Joseph as the supposed fraudster would smooth out the narration as he dictated. Given the ease of these options, it makes no sense that a con man would keep in the mistake and write a follow-on clarification. So the question: Are there any phrases, words, sentence structures, etc. in the Book of Mormon that would be consistent with stylus on metal but not with pencil or pen on paper? If dictated from an engraving, one is more likely to find both the mistake and the correction – the statement and the restatement. If dictated from paper, one is likely to read only the correct version of what the author intended, but not the mistaken writing that immediately preceded it. With that in mind, consider these scriptures in which the author reverses or clarifies a mistake. Bracketed notes in italics are my observations. The “weapons of peace” mistake in the first example has been a source of mocking humor against Mormons for decades. As one critic put it, “What is a weapon of peace? Is it a material object so it can be buried? Can a weapon of peace be like a weapon of war?” Ha ha ha. Yet the very verses critics laugh at are indicators that Joseph Smith did not dictate the Book of Mormon from text written on paper. 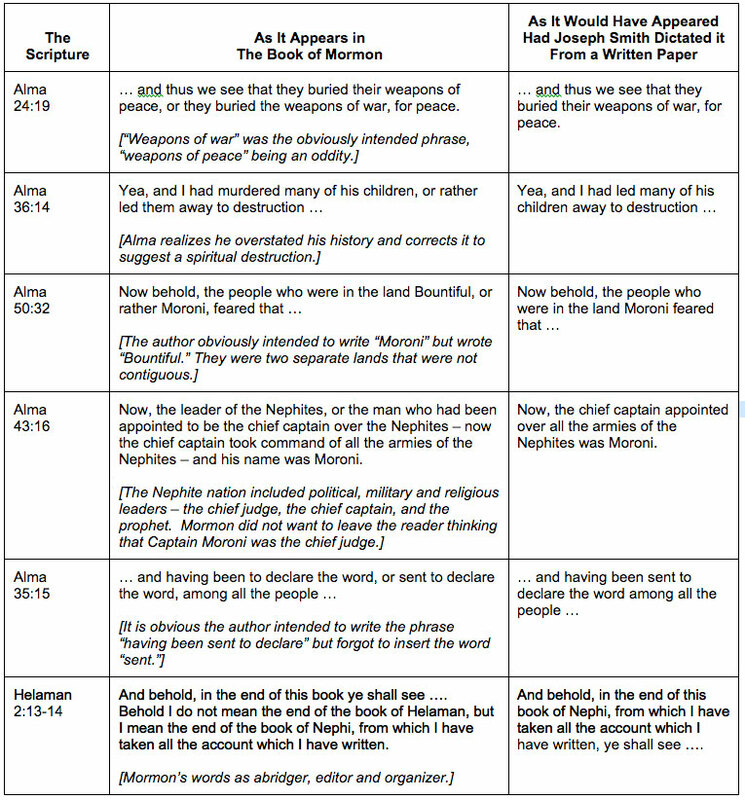 If Joseph Smith or some other 19th century person had written the Book of Mormon with intent to defraud, he would have eliminated (or not even allowed in the first place) any statement-restatement patterns in the text that he read to the scribes. A con man would not admit in his writings that he had stated something not quite right and then had to correct it. No such phrasing would have been allowed into the final text. After all, since he’s claiming it to be a work from God, it had to be perfect with no room for oops-let’s-begin-again errors. The examples shown above may indeed be the “mistakes” Moroni was referring to, but at the very least are mistakes that lend the book the authenticity and smell of engraving. Do these statement-restatements prove that the source material was engraved on metal plates? Of course not; that testimony comes only from God through sincere study and prayer. But their appearance in the Book of Mormon would surely make less sense if they had originally been written in English on paper. The mistakes authenticate the mode of its creation.